This article will help show you how to turn your shatter into e juice and vape it. Shatter is an herbal concentrate that is primarily made using butane and has a translucent glass-like texture and consistency. When stable, the shatter can remain in this state for a long time, even at room temperature. If the shatter is unstable, sugaring will occur. This is more like turning wax to e liquid. There are a lot of different grades of shatter. Some dark-colored ones are made from old trim material; this captures more chlorophyll and other plant material since so much time has elapsed that the terpenes present had time to escape before the material was processed. Freshly processed material has a lighter color and a more pungent smell as more terpenes are present. The temperature at which the cannabis material was extracted makes a big difference in quality and THC-A content. The good news is no matter what physical state the shatter is in, it will work great to turn into e liquid with Farm to Vape. 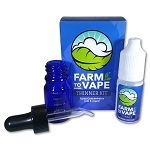 First you take one gram of shatter and add to the boilable dropper bottle in a Farm to Vape kit. Then fill it up with the Farm to Vape to the rounded shoulder, just below the threaded top of the glass. Then close the cap and boil for three minutes. Remove from heat (this will be hot, caution) and shake well. Fill your tank or drop directly on your RDA. That's all there is to it. Our strawberry kit uses flavor from real strawberries and makes a great pairing with strawberry cough shatter! Play with the flavors and your different strains to find your favorite delicious tasting mixes. Work's great absolutely love it!! !